The listed individuals "are convicted of preparing terrorist acts in Odesa, Kharkiv, Kyiv, Kherson, or for taking part in hostilities in Donbas, or they are under prosecution." Ukraine’s first deputy speaker and humanitarian envoy to the Minsk talks, Iryna Herashchenko, has named 23 Russians whom Ukraine is ready to swap for illegally detained Ukrainian political prisoners. 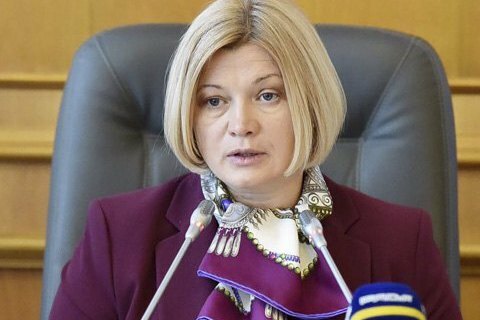 Speaking at a briefing on Monday, 2 July, Herashchenko said she was authorized by the Ukrainian special services to disclose the names of those "whom we are ready to transfer to Russia for the release of such Ukrainians as [Oleh] Sentsov, [Oleksandr] Kolchenko, [Roman] Sushchenko, [Pavlo] Hryb, [Volodymyr] Balukh, [Yevhen] Panov and those guys who are held in the occupied territory," an UNIAN correspondent reports. She disclosed 23 names: Viktor Ageyev, Aleksandr Baranov, Anatoliy Busygin, Valakhidis Aleksandr, Vyacheslav Vysotskiy, Ruslan Bedzhiev, Valeriy Gratov, Vladislav Grechin, Oleg Doronin, Sergey Yegorov, Valeriy Ivanov, Igor Kimakovskiy, Olga Povaliz, Vasiliy Kusakin, Vladislav Makarov, Yevgeniy Nefyodov, Maksim Odintsov, Aleksey Sidikov, Denis Sidorov, Maksim Slivka, Pavel Chernykh, Larisa Chubarova, Yevgeniy Shatalov. According to UNIAN, all surnames are reproduced as heard, so misspellings of the names are possible. Herashchenko said the listed individuals "are convicted of preparing terrorist acts in Odesa, Kharkiv, Kyiv, Kherson, or for taking part in hostilities in Donbas, or they are under prosecution." Herashchenko said: "Take yours, give the Ukrainians back." As UNIAN reported earlier, Ukrainian ombudsperson Lyudmyla Denisova said on 29 June Ukraine was ready to transfer 23 Russian citizens to Russia in exchange for 23 Ukrainian political prisoners illegally detained or convicted and serving their terms in Russian prisons.